A recent review has identified several risk factors and limitations of past articles that examine physician suicides and its causes. Investigators reviewed 347 published articles and found that physician suicide, while a significant problem, is poorly understood and identified multiple possible interventions that could help. Investigators conducted a scoping review to evaluate the current landscape of research and perspectives on physician suicide. They believed potential findings could serve as a guide for further investigations and inform effort to prevent physician suicide. Investigators searched for data within the Ovid MEDLINE, PsycInfo, and Scopus databases from Aug. 21, 2017 through April 28, 2018. In order to be included in the investigators’ review the primary outcome or thesis must have focused on suicide, must have pertained to medical students, postgraduate trainees, or attending physicians, been an opinion article, and have no date boundaries. Studies that were not in English or focused only on physician burnout, mental health, or substance use disorders were not included. Investigators identified 2036 articles for screening and narrowed that number down to 347 based on inclusion criteria. The highest number of articles from one country was 51 (14.7%) in the US, but investigators examined studies from a total of 33 countries. Of the 347 articles, 142 were opinion articles and 205 were non-opinion. A majority of the non-opinion articles (63.4%) were published after 2000 and 80 (56.4%) of the opinion articles were also published after 2000. Of the 205 non-opinion articles, cross-sectional studies were the most common — representing 41.5% of all non-opinion articles. Other types included review (16.6%), case report or case series (10.7%), case-control (9.3%), cohort studies (6.8%), intervention (6.3%), and 18 (8.8%) studies were classified as other. Primary outcomes for the non-opinion articles included death by suicide, suicide attempts, and suicidal ideation and thoughts — some articles included more than one of these as primary outcomes. Study populations for the same articles included attending physicians, medical students, and residents and fellows —some articles included more than one of these population groups. From these, investigators identified several unique risk factors and less-studied risk factors for physician suicidal behaviors. Unique risks included specialized knowledge, access to lethal methods, and specialties. Less-studied risks included personality traits, adverse childhood events, relationship status with a partner, relationship with parents, economic burdens, religiosity, and cultural upbringing. Investigators concluded that there was a lack of consistent, reliable data and information that is limiting prevention efforts. They called for further studies to examine both unique risks and less-studied risks more thoroughly. 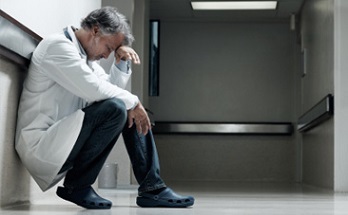 Investigators added that policy reform, organizational programs, education reform, and cultural and behavioral change is needed to address the problem of physician suicide. This poster, titled “Physician Suicide: A Scoping Review,” was presented at the ACP 2019 Internal Medicine Annual Meeting in Philadelphia.